The advert has a sequel – the mum-to-be is having an ultrasound and explaining that her unborn baby is really energetic and moves around constantly. Despite the inconveniences of being constantly kicked in the ribs and not getting any sleep because baby wakes up when you lie down, having an energetic bump is a good thing, because energetic = healthy, obviously. And as your baby eats what you eat, this baby is healthy because his mum nourishes him with chocolate spread! Of course. I don’t remember seeing that on the recommended foods list I was given by my obstetrician, he must have forgotten to include it. Anyway, so, 33% of the many, many adverts in this ad break were for chocolate. The next largest slice of soft-sell pie goes to… cleaning products. A very popular range with Barbie fans. One of the adverts is notable by having some men in it, or rather, one man and one boy. They have been roped into cleaning the bathroom tiles with Mum as her current cleaning products just involve so much hard work. But what is this? Father and son go into the bathroom later, Mum is on her own in there cleaning and the tiles are shining! She’s only gone and bought some Cillit Bang. So life can return to how it should be: Mum doing the cleaning and Dad and Junior can go and kick a ball about, or play Scalextric, or something masculine like that. There’s a life lesson for you, my 3-year-old Barbie fan daughter. In fact, apart from one rogue ad for men’s razors, these are the only men selling products in Barbie’s world. 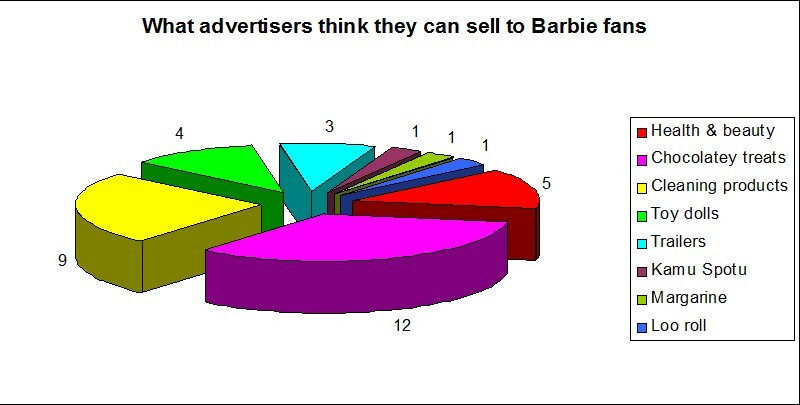 Turkish advertisers clearly don’t think Turkish men watch Barbie! And they obviously don’t think Turkish men do much cleaning. How sexist. So me and my daughter will get back to watching Barbie while I do the housework. I wonder where my husband is? This entry was posted in Uncategorized and tagged Barbie, chocolatey treats, Cillit Bang, feminism, Sarelle, Turkish advertising, turkish culture, Turkish men doing housework. Bookmark the permalink. There is now a cleaning advert in Turkey where a man’s doing the cleaning, and it’s not for comic effect. I’m sure it’s still aimed at women (lovely, considerate man uses his lovely, quiet vacuum cleaner so he doesn’t disturb his lovely, peacefully sleeping wife and children – who wouldn’t want one of those? Do they come free with the vacuum cleaner?) but nevertheless feels very refreshing – thank you Bosch, if I could afford your vacuum cleaners I would buy one just to show how much I appreciate that ad!